The OHS welcomed over 800 visitors to the historic John McKenzie House for Doors Open Toronto 2017, held May 27 and 28. The event marked the 18th consecutive year that the Ontario Historical Society (OHS) has opened the doors of the John McKenzie House to local residents from all across Toronto. The OHS also greeted a number of international visitors and tourists from various parts of Canada. When guests arrived at the John McKenzie House, they were greeted by Doors Open volunteers and OHS staff, who offered guided tours of the house and handed out pamphlets detailing the building’s impressive history. For many visitors, this was their first time taking a tour of the house. Though the OHS maintains an active relationship with the local community and has participated in Doors Open for 18 years, Willowdale welcomes hundreds of new families and individuals into the community each year. The OHS is enthusiastic about sharing the history of Willowdale with new residents and tourists. 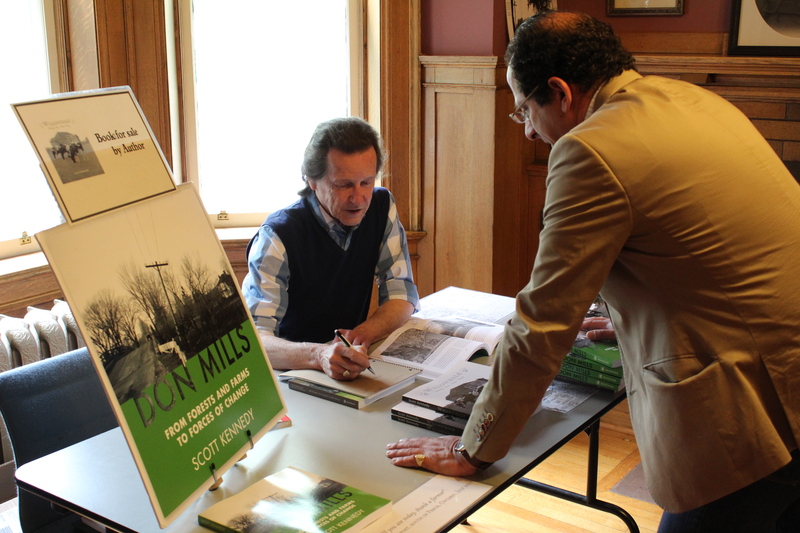 This year, local historian and author Scott Kennedy joined the Ontario Historical Society to help educate guests about the history of Willowdale and the John McKenzie House itself. Author of Willowdale: Yesterday’s Farms, Today’s Legacies, Kennedy used some of his primary research materials—including early maps of Willowdale and North York—to help new residents and guests understand the agrarian heritage of the community in which they now live. The John McKenzie House, built in 1913, stands as an early example of residential development on what was traditionally farmland. Kennedy’s knowledge of the local history and his collection of maps helped shed light on the rapid development of Willowdale, which transformed a vast expanse of farmland into an urban sprawl in less than a century. Kennedy also displayed copies of his most recent book, Don Mills: From Forests and Farms to Forces of Change, which piqued the interest of many guests, including Ali Ehsassi, Member of Parliament for Willowdale. MP Ehsassi paid a visit on Saturday morning and engaged the author in a lively conversation about the history of North York. Since Mr. Ehsassi is both the current MP for Willowdale and a former resident of Don Mills, the two had a great deal to talk about. Ehsassi purchased half a dozen copies of each book for friends, family members, and his constituency office. Kennedy was delighted to see the MP’s interest in our local history and signed a personal note in each of the books. For more information on how to volunteer with the OHS for Doors Open Toronto, please contact us at ohs@ontariohistoricalsociety.ca.